I maidened today. It was a bit windy and I was trying out a new flying place. The maiden went OK but the wheels snagged on landing and one of the wing leading edges got a bit scraped. It fealt a little unstable but it was very windy. I can't wait for a nice day so I can try out the FPV. The wings on my MG were deteriorating despite the wood sticks and were bending upwards quite a bit.. also humidity in the area doesnt help (very humid coastal area, 80 to 100% humidity often) and its a first gen kit with the white foam board..
so today i did an idea i had for a while.. cuted a slit on the wing extrados (upper area) in the area where it tops the airfoil.. and iserted 2 3X1mm carbon spars inserted on the wing on the flat side of the spar (the one wich doesnt bend) with both carbon rods soaked in epoxy ... once done i put more tape over it..
and it worked perfectly.. wing is again flat in flight.. like new. My FB constructions used to last about 2 years before the repairs required would take more time and effort than rebuilding them. I read a lot about "Minwax" in the forums and how it was used to seal the FB prior to painting and so I looked around for a local equivalent. I found a local version of a wipe on Poly varnish and started using it to seal ALL paper surfaces prior to assembly and now my planes are so stable and water resistant that I have even been flying in light rain. (you would need to waterproof the electrics though). My oldest, "Sealed" FB model is now Almost one year old and apart from a few broken glue joints, (Blasted trees), there is no other damage or change in its geometry, appearance. or performance. Trying sealing the FB and the FB will remain stable and warp free. Please note that most hotmelt glues do not adhere to the sealed surface but I use a liquid craft glue that penetrates the coating and the paper to glue everything together really well. If you use Minwax or its equivalent you want to put that on after assembly, which has work well for me so far, over a year old now. As Hai-Lee pointed out hot glue does not want to stick to it. I read you can use sanding sealer also, it worked well for me. 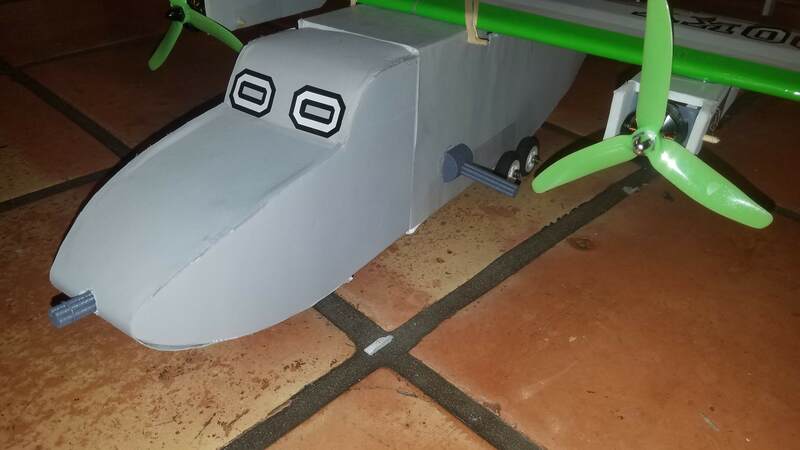 I put it on after built and the plane looks well and is over a year and a half old. I have also used spray paint with very light coats from a distance. It also has worked well, but it takes practice to get the distance and light yet effective coating. I think each method adds to your airframe's durability. Hello everyone ... i need a FT Mini Guinea plans &#305; have a same problem at server ..."503 - Service Unavailable"
Welcome to the forum. This issue is being checked on over in the plans thread, see link below. 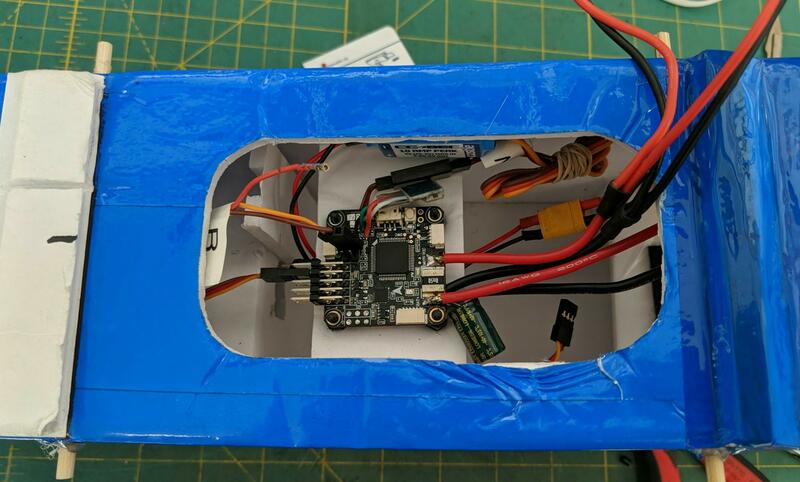 Anyone put a flight controller in their Mini Guinea? 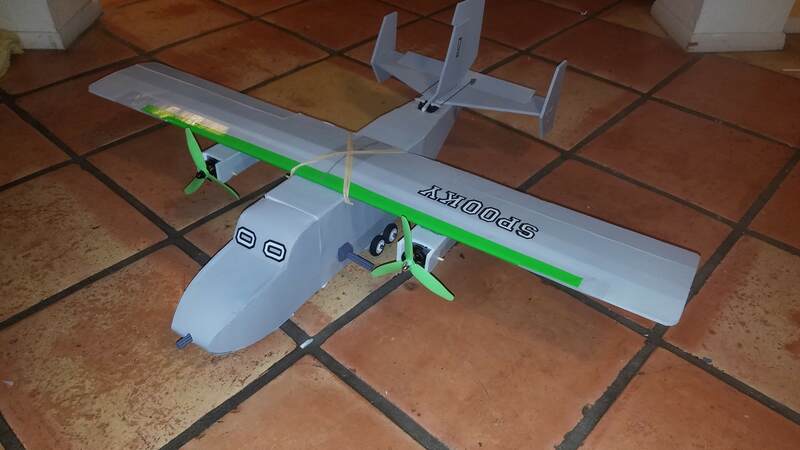 Going to try it out for the launch mode and some stabilization, running iNav 1.8. Last Friday I flew the MG with the iNav FC...however it was a rather windy day. It was flying well for how windy it was out, but unfortunately I got headed towards some pines on the edge of the field I was flying over and ended up stuck about 50ft up. Since I had it running with an FC and it was not sitting level in the tree I couldn't spin the motors. Per normal quad practices I disarmed when i hit the tree. Couldn't get it out, so it was up in the tree for two days. Sunday I had MultiGP race practice and when I got back home I decided to try to hit it out again. Two good hits and I was thinking it would come down on the next hit or so. I was setting up my GoPro to catch it falling when a gust of wind came along and knocked it free! Nine seconds of "well, never mind, then". Glad you got the electronics back, even if the body isn't salvageable. ok, finally found this thread, knew there had to be one. i started my scratch build MG today and life was easy and good! 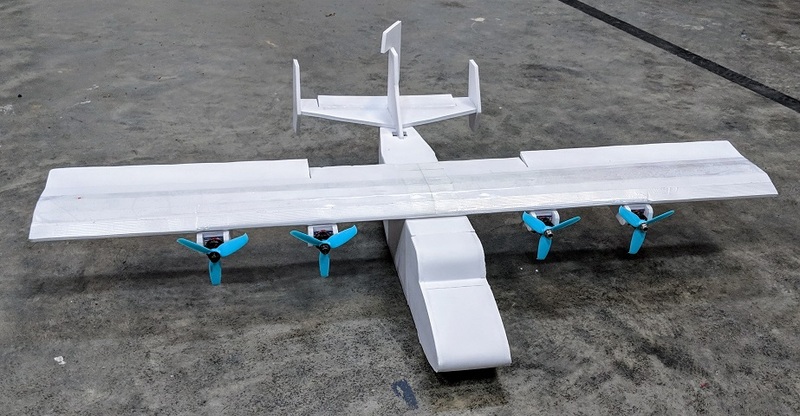 the plan is to turn it into a look-a-like AC130 gunship. i had the chance to pre-order the new Avios C-130 but due to price and the fact i was offered the Blue Angels version, not the grey one, i passed. instead i decided i should just save some cash and scratch build a mini - G.
plans printed, taped to foam board, and cut out without issues. i then took it outside for paint. this is were it all goes wrong. i have been spray painting DTF board w/o issues for a long time. never had any problems so long as you start the spray off the board, then move on. well, today when i bought paint i went cheap and did not buy the rustoleum i usually get and instead got some ACE hardware cheap stuff. cheap being the optimal word, not only did it have very poor coverage but also started to peel the paper from the board. so now i have a cut out MG, but not sure if i will be able to salvage it. i am letting it dry, then will assess it in the morning. hopefully i can just peel off the loose paper, then spray with super77 and reapply it. woke up and things weren't as bad as i was thinking. i was able to salvage the fuselage and only lost the horizontal stab and bottom plate with the drop hatch. those were easy enough to trace back out and cut fresh pieces from DTF. i went and bought some real spray paint today and set of work. the rustoleum 2x is hands down the best paint to use and really, isn't much more than the cheap paint it bought to begin with. lesson learned. the plan is to run two 2204-2300kv motors. one CW, the other CCW with a 12A esc and a 5x4x3 prop. i had originally planned on using 20A esc's but when i went to the supply closet i came up a little short. plenty of 30A's but no 20's. so, i hope the 12A will be ok. will run on a 3S battery, hopefully in the 1300 range. the plan as mentioned is to make it look like a Spook AC-130, or at least a mini version of it. 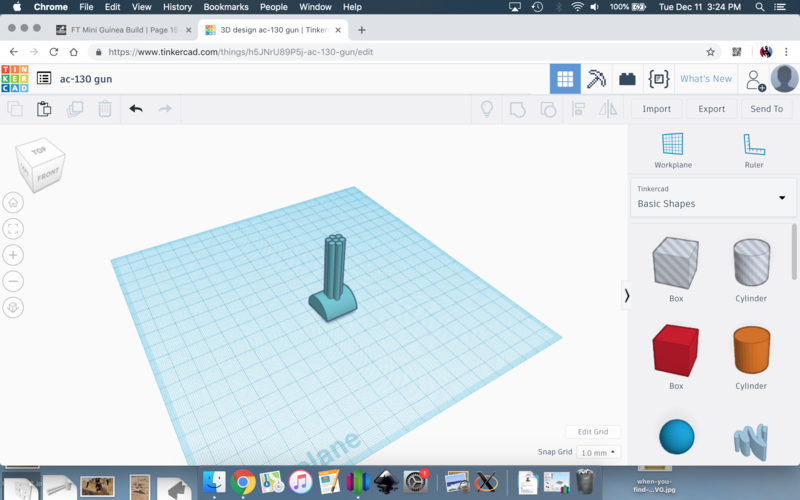 with that in mind i spent a little time over at tinkercad and designed a look-a-like 20mm cannon. feel free to download for yourself. almost finished, still need to add wing guns and some details but i'm done for the day. have it set with diff thrust and wanted to do a flaperon setup but ran out of channels on the rx. will have to hunt down a 8 channel so i can do diff thrust, flaperons, and the drop gate. will maiden tomorrow. balanced perfect with a 3S-1300. Hey thanks I have been looking for this info on its build and recently ordered one. I down loaded the plans but awaiting for my kit to arrive. Looking forward to its build. Thank again. Spooky flew amazing. took off with no issues from our now rough field (some arse hat decided to ride his quad on the runways and do a bunch of donuts) and once in the air it needed just a click or 2 of trim and it was hands off stable. has MORE than plenty power and with the diff thrust can do some crazy spins! immediatly one of my new favorite fliers without a doubt. Rasterize had his full size Guinea out today and we were able to do some formation fly-bys which was cool. at one point we had nothing but twins in the air, not sure i have ever seen that at our club before. will put the finishing touches on it tonight and fly again tomorrow! Got the bird's nest of control wires for the wing sorted out. For now going to run the motors in pairs, but have thoughts about splitting off the outside motors to have differential. 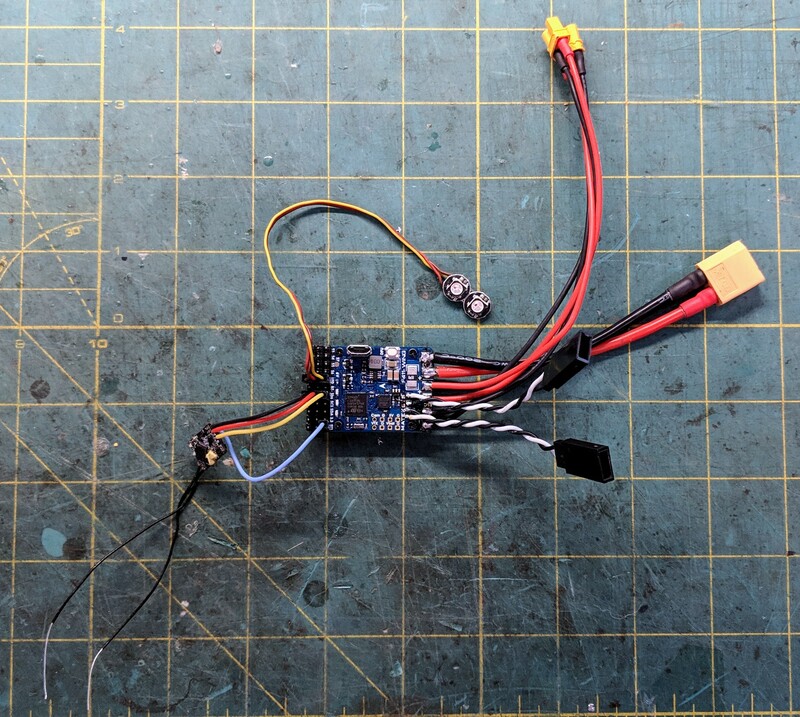 I am waiting on a Matek F411-wing FC to allow me to use a FrSky R-XSR receiver as well as have some stabilization control, may even add fpv later. The 2x LEDs, circles directly above the FC, are for indicating ARM status and GPS status. Since I won't be running FPV, at least to start, I need to know when GPS lock is good before ARMing. Oh and since i shrunk the Mini Guinea a little, I'm calling her the Minier Guinea. With Modified C-130 style nose she's 21" in length and 31" wingspan.